Our rhinoceros gallery features images of the white rhino, as opposed to the critically-endangered black rhino which is much harder to locate and photograph. The names have nothing to do with color - both white and black rhino are in fact grayish-brown. These prehistoric looking animals love wallowing in muddy pools and also like to dustbathe, so the color you see is also influenced by this behavior. Both rhino species are mercilessly hunted by poachers for their horns which, sadly, are still much sought after as ingredients for traditional Chinese and Vietnamese medicines, or for use as dagger handles. (See Rhino Poaching Crisis in South Africa for more). White rhino (distinguishable by their larger size and prominent square lip) are not as ill-tempered as the black variety and in most cases will simply ignore your game-drive vehicle, allowing you to get quite close for taking pictures. The numbers of white rhino in South Africa's Kruger National Park have increased substantially in recent years, particularly in the south of the park, providing excellent picture opportunities for those enjoying a Kruger safari. The black rhino, although regarded as more dangerous than its white counterpart, is a lot smaller and physically no taller than a Cape buffalo (but it weighs twice as much as a buffalo). White rhino on the other hand are massive animals and classified as the second largest land mammal after the African elephant - although they are outweighed by hippo! A number of the white rhino shots featured here were taken in Hluhluwe-Umfolozi Park, a conservation area renowned for its population of both white and black rhino. It's also the area from which most of the world's white rhino can today trace their ancestry, thanks to early rhino capture and relocation initiatives. 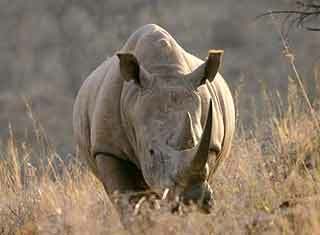 To find out more about both these animals, see Rhino Information, and Black Rhino Information.